Editor’s note: At SunPower we’re always developing innovative applications of our solar technology, making clean energy more accessible to everyone from university solar race car teams to world record setters such as Solar Impulse II and Planet Solar. This Earth Month we’re honoring the planet by sharing the inspiring story of the Energy Challenge, a competitive ocean racing team that is proving that clean, emissions-free solar energy not only is reliable in the roughest of conditions but helps protect the ocean and our air while outperforming vessels using traditional fuel sources. Solar energy is a competitive advantage on the open seas. The significant power demands a sailing yacht requires running on-board navigation, communications and autopilot systems means that energy must be consistently available. By integrating SunPower’s solar technology, not only have we overcome common and time-consuming issues with diesel generator failure and power outages, but we can also reap the benefits of quiet and fume-free sailing, enabling us to race across the ocean in its natural environment. Currently we are the only zero emissions race boat in the Class 40 (ft) Championship, and our aim is to race around the world, non-stop and with zero fossil fuels on board. 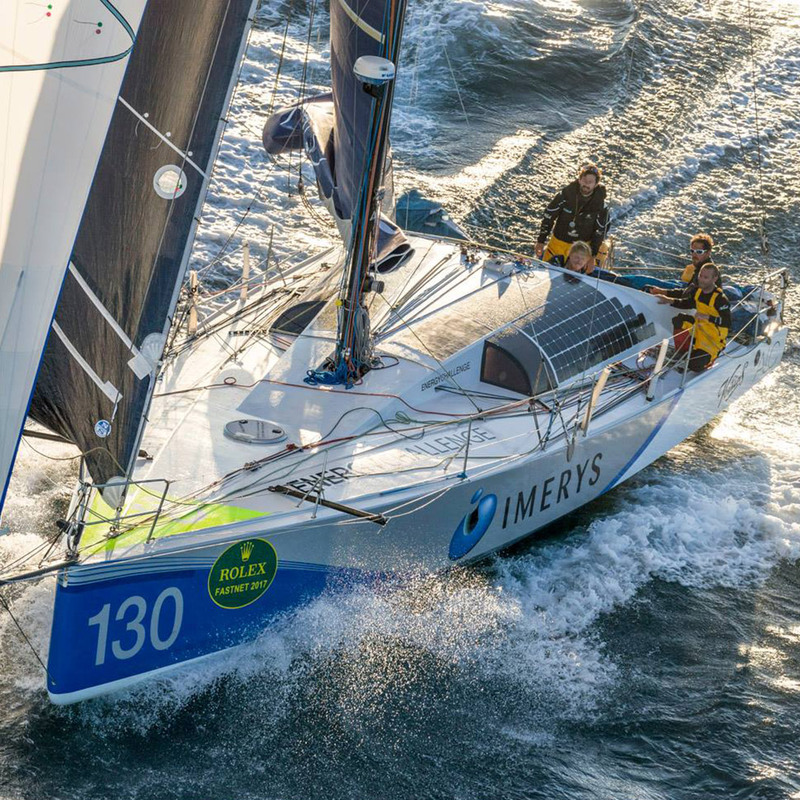 The Energy Challenge is developing a race entry for the infamous 2020 Vendee Globe, a non-stop and single-handed round-the-world race, within the IMOCA 60 (ft) Class. Whilst this endeavor is key to educating and inspiring the public to move to cleaner technologies, achieving top results in these global races allows us to demonstrate the benefits of renewable energy across the marine sector, which can be scaled and applied to both the leisure and shipping industries. Last year, the SunPower® solar cells that power the Class 40 race boat Imerys Clean Energy succeeded in battling through severe oceanic conditions, with Atlantic swells that frequently topped 7 meters (23 feet), withstanding winds above 70 kph (45 mph), and multiple high impacts from heavy-footed sailors! Bridging the high performance racing arena with renewable technology is an ongoing objective for the Energy Challenge team, and I’m really pleased to say that we won last year’s Championship on zero emissions. Sailboats may look clean on the outside, but when it comes to their diesel engines and generators, which are used to power motors and on-board electronics and equipment, they can be very environmentally dirty vessels. With the Energy Challenge, led by Phil Sharp Racing, we’re demonstrating the performance advantages of clean technologies without compromise, aiming to win the world’s most competitive ocean races on zero CO2 and leaving behind boats that still rely on fossil fuels. Our goal was to optimize performance by capturing large quantities of clean solar energy offshore, allowing the race boat to meet the power demands of its electronics, including navigation and routing, and to operate the sophisticated autopilot for short-handed sailing. It was essential to integrate cutting edge flexible photovoltaic cell technology that could meet such demands efficiently while being durable enough to defend against exposed and harsh oceanic conditions and to withstand the weight of crew members changing the sails. SunPower’s high efficiency lightweight flexible solar cells were the obvious solution to provide sustainable energy to the Class 40 Imerys Clean Energy. Last year we kicked off our Energy Challenge endeavor by being the first to win an offshore championship race on zero CO2, finishing the 1,000 mile race with an astonishing lead of more than 30 nautical miles. While racing — and winning — on zero emissions was our first goal, ultimately this project aims to replace the diesel engine with a self-sufficient hydrogen-electric clean energy system. The team is developing a practical solution for clean energy that offers a lighter solution than traditional diesel engines, while providing greater energy independence and reliability, improving the health of our oceans and reducing air pollution. We made history in 2017: We were the first zero emissions vessel, free from fossil fuels, to win an offshore Championship, and on April 23 we’ll kick off the 2018 race season building up to the infamous single-handed Route du Rhum race from St. Malo, France to Guadeloupe, which starts Nov. 4. A significant 120 boats and skippers across six race classes will be on the starting line, and more than 2 million visitors are expected at the race village. Imerys Clean Energy will be the only zero emissions boat racing. Ocean racing is about pushing human and technological boundaries in a race to win, but we believe that there is a much more important race at stake: a race to save the oceans. Winning with clean energy shows that innovations in marine power systems can truly help decarbonise the boating sector. Anything we can do to make a difference will help reduce the harmful effects of carbon in the ocean, such as acidification that harms ocean wildlife or global warming, which increases ocean temperatures and sea levels, further threatening our ecosystem. The Energy Challenge aims to win the toughest ocean races, whilst acting as a test-bed for cutting-edge renewable technology. Our aim is to communicate and demonstrate the performance advantages of clean-tech and aid the transition to a clean future for marine power. Sourcing clean energy from SunPower cells, the Challenge aims to be the first hydrogen-electric vessel to sail round the world through an entry in the Mount Everest of sailing, the 2020 Vendée Globe. This solo, non-stop round-the-world race is the pinnacle of ocean racing and widely known to be one of the toughest sporting events on the planet. Phil Sharp is Skipper and Technical Director of the Energy Challenge at Phil Sharp Racing. In 2016 he earned a Guinness World Record for establishing a new World Speed Sailing Monohull Record, single-handedly traveling across the English Channel from Cowes, Isle of Wight to Dinard, France at an average speed of 15.25 kts (28 kph / 17 mph). As the designer of the most powerful and reliable solar you can buy, SunPower offers unique advantages. Visit our website to learn more about creative uses for solar cells and 50- and 100-watt flexible solar panels or to get the same great solar on the roof of your home or business.